Double pack. Just recently we tested the 6-inch model Slate 6 VoiceTab, now the 7-incher HP Slate 7 6100en VoiceTab has arrived at our test laboratory. The Marvell quad-core SoC clocks slightly higher, and the IPS display has a marginally higher resolution of 800x1280 pixels. The performance is, nevertheless, not much better. HP wants to attack competitors like Asus with its Fonepad series and therefore launches the Slate 6 6000en VoiceTab and Slate 7 6100en VoiceTab phablets. 3G modems and telephone functions turn both devices into genuine but outsized smartphones. 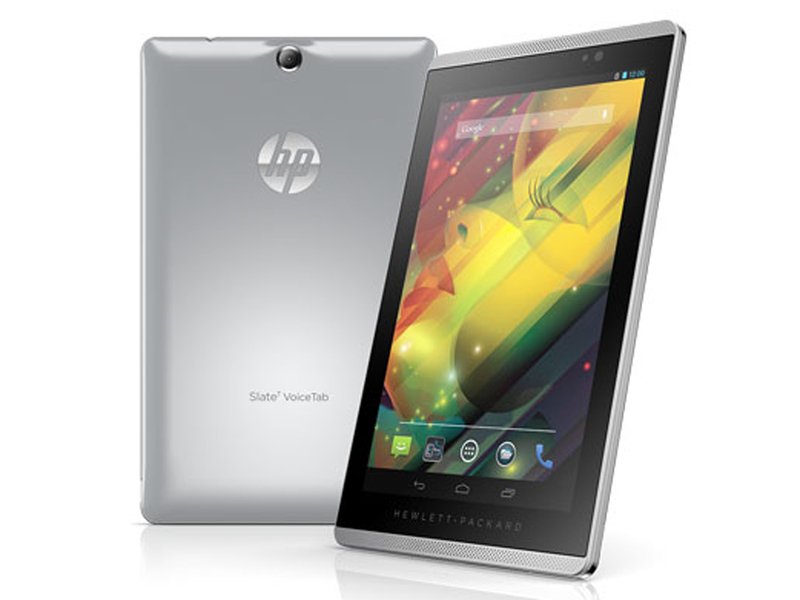 Our test device HP Slate 7 6100en VoiceTab comes with a 7-inch IPS touchscreen with 1280x800 pixels. The phablet is driven by a quad-core SoC from Marvell with 1.18 GHz clock frequency complemented by 1 GB RAM and 16 GB eMMC flash memory. Additionally on board: Android 4.2.2 and a 3G module. The device costs only 219 Euros (~$297). We have chosen the Asus Fonepad Note FHD 6, the Huawei Ascend G730, the Acer Liquid S1 and the Samsung Galaxy Note 3 Neo SM-N7505 as potential competitors for the HP Slate 7 6100en VoiceTab. And, of course, the HP Slate 6 6000en VoiceTab. The case is almost identical with that of the HP Slate 6 6000en VoiceTab, but a bit bigger. It is still made of silver-colored polycarbonate. However, the positions of the interfaces, the physical buttons and the speakers, have changed. 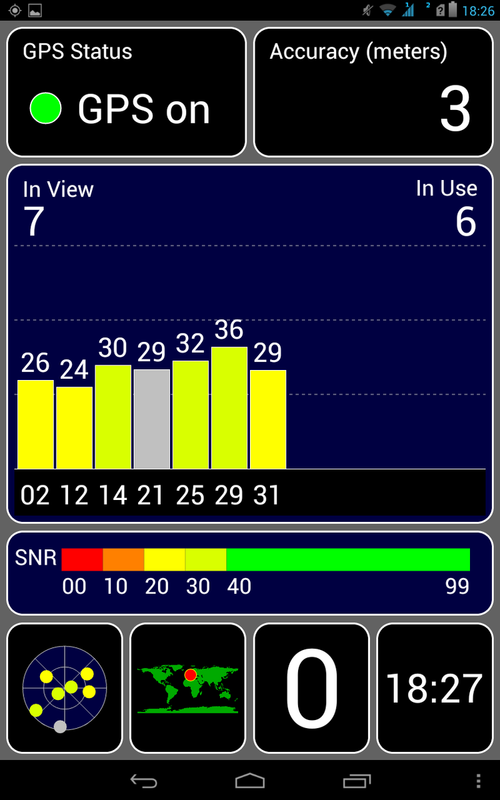 The build quality is at the same good level as the Slate 6 VoiceTab. However, the test sample is not as torsion resistant. Furthermore, the case looks somewhat cheap due to the choice of materials. Once again both SIM card slots as well as that of the microSD card are hidden underneath the back cover. The weight has increased just as the size did - the scales display 325 g. Thus the phablet is not compact enough for pants pockets. HP uses - as for the Slate 6 6000en VoiceTab - a quad-core SoC from Marvell, namely the PXA 1088 combined with a Vivante 1000 graphics card. 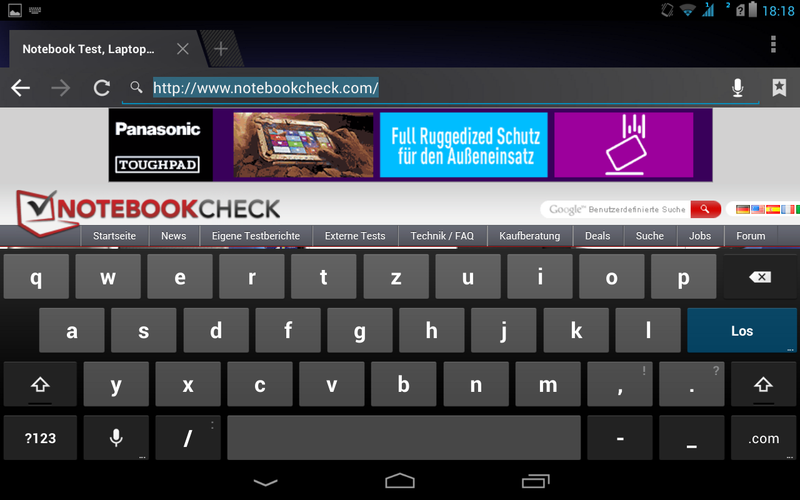 However, with 1.18 GHz the SoC clocks slightly higher in the Slate 7 6100en Voice Tab. RAM and internal eMMC memory stay the same (1 GB and 16 GB resp.). The memory capacity can be extended via microSD card up to 64 GB. The micro USB 2.0 port and the 3.5 mm jack were positioned somewhat differently at the front side. Unfortunately, the power button moved to the left side to the volume rocker. This makes taking screenshots less convenient. 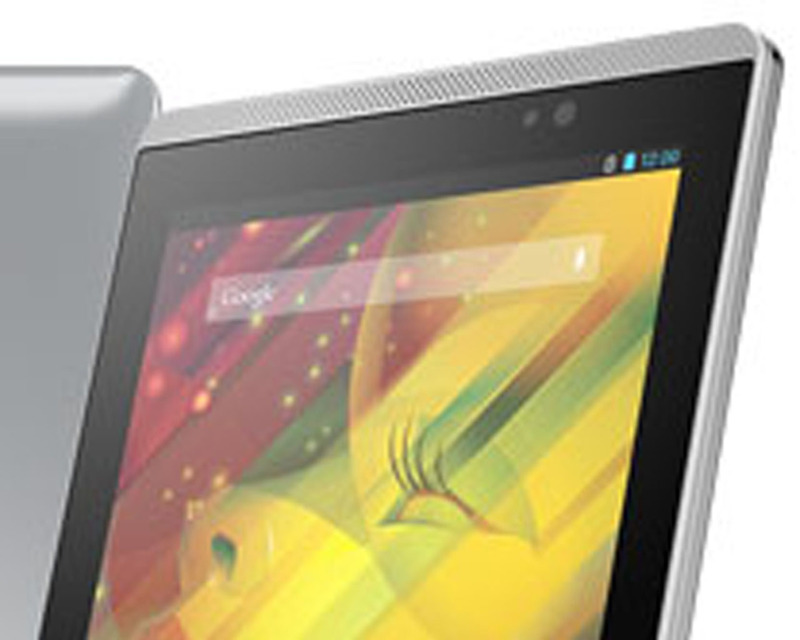 The operating system of the HP Slate 7 6100en VoiceTab is the same as that of the 6-inch model, which has an unaltered Android 4.2.2 Jelly Bean. Updates to current versions have not been announced. 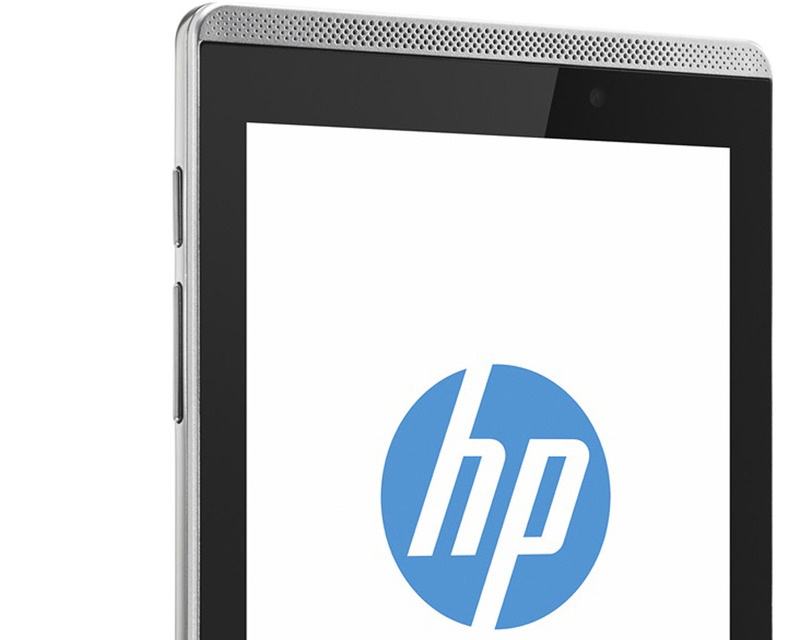 The HP Slate 7 6100en VoiceTab transfers data wirelessly via WLAN 801.11 b/g/n and UMTS dual-band (900, 2100). Unfortunately only SIM slot 1 supports 3G. 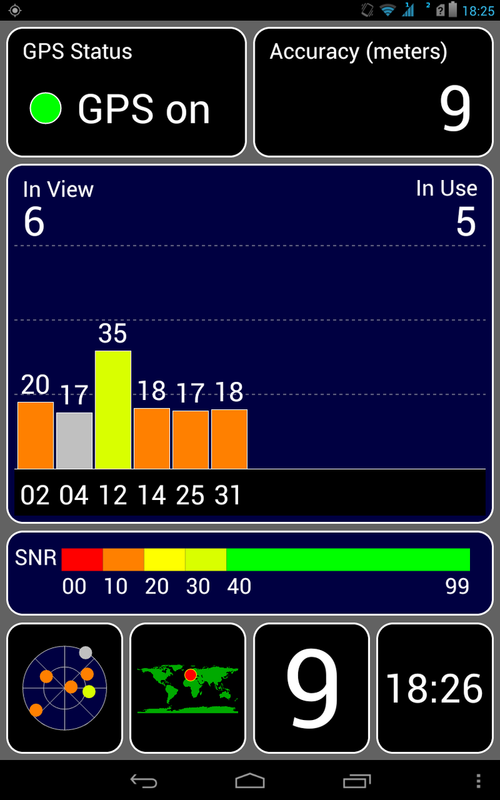 Quad-band GSM (850, 900, 1800, 1900 MHz) is supported by both SIM slots. 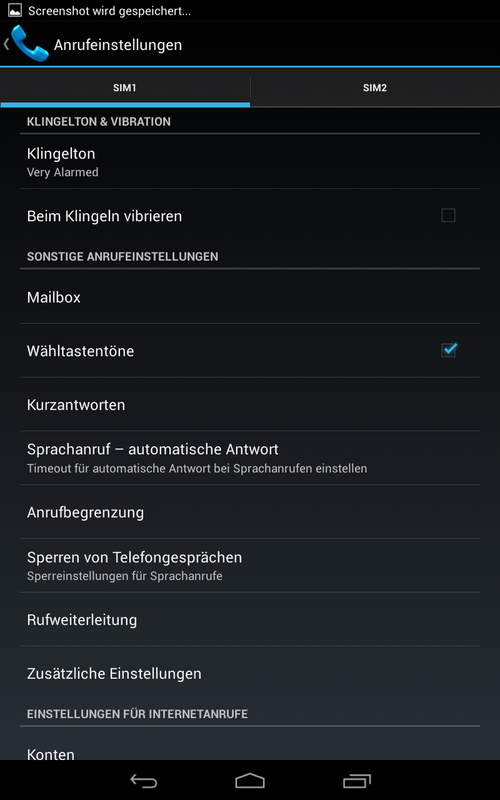 Bluetooth 3.0 + EDR is also on board. The WLAN has a decent range. 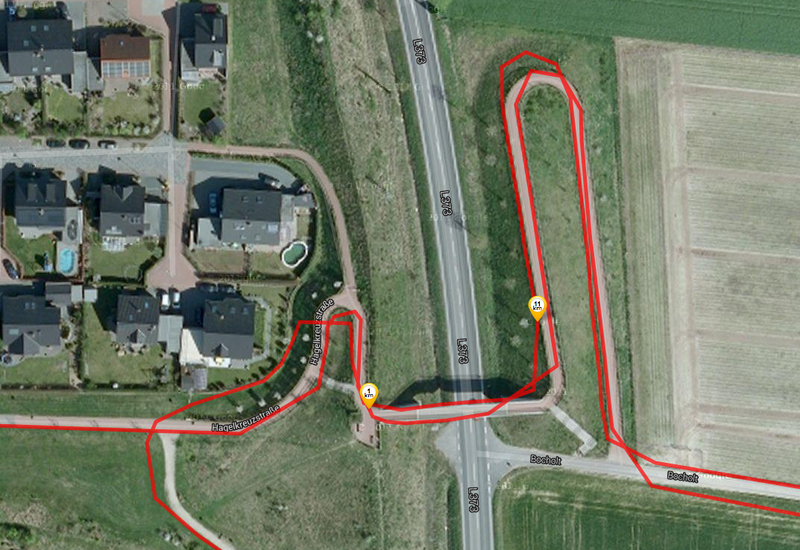 In our test the test device still reached half of the bars with several walls in between and a distance of 10 meters to the router. 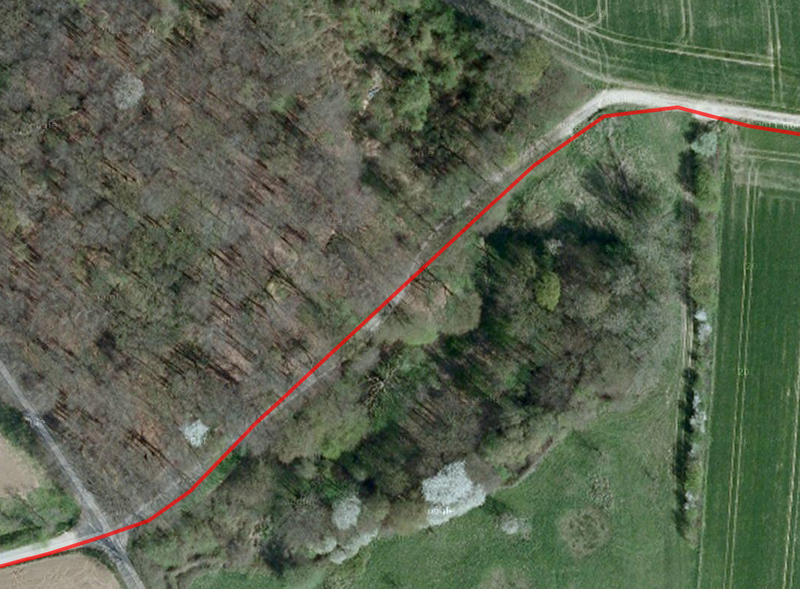 Our test of the GPS module attests the test sample a good locating capability even in enclosed spaces, which improves in accuracy outdoors. 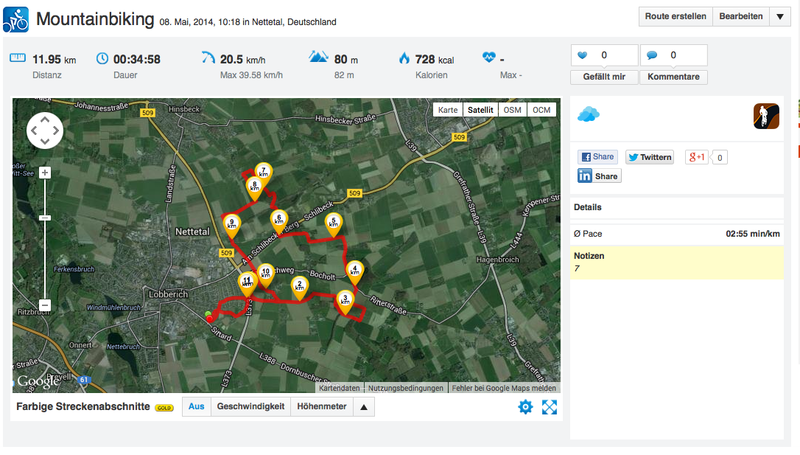 In direct comparison to the Garmin Edge 500 on our bike-test track the HP Slate 7 6100en comes off well and shows only minor deviations in difficult areas. Therefore navigation is quite possible. The same applies to the HP Slate 7 6100en VoiceTab as for the HP Slate 6 6000en VoiceTab. Therefore we refer to the extensive review. Apart from the missing LED flash, the built-in lenses match those of the HP Slate 6 VoiceTab: A resolution of 2 megapixels for the webcam and 5 megapixels for the main camera. Thus we once again refer to the respective chapter in the review of the HP Slate 6 6000en VoiceTab. HP adds the battery, a modular USB power supply with 5.3V/2.0A and a quick-start guide to the smartphone itself. 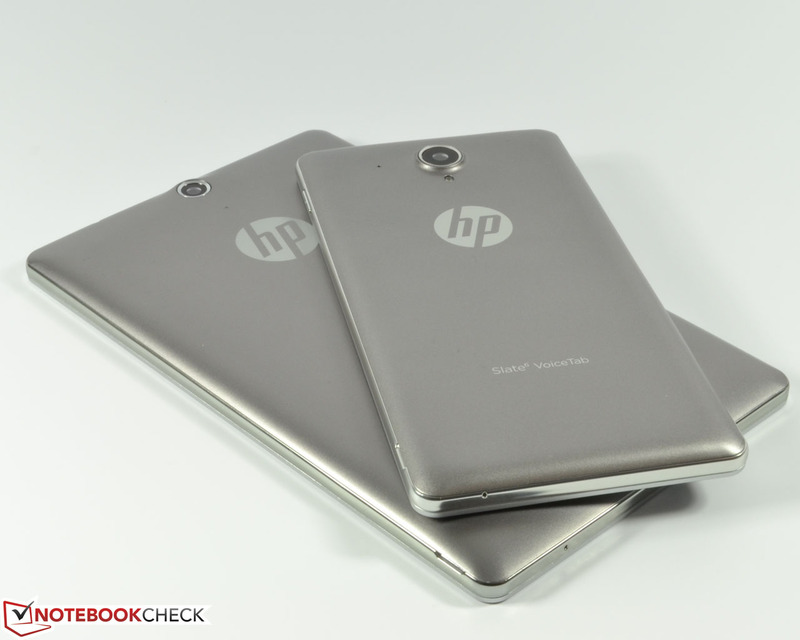 HP offers an optional screen protector and a table charging station. 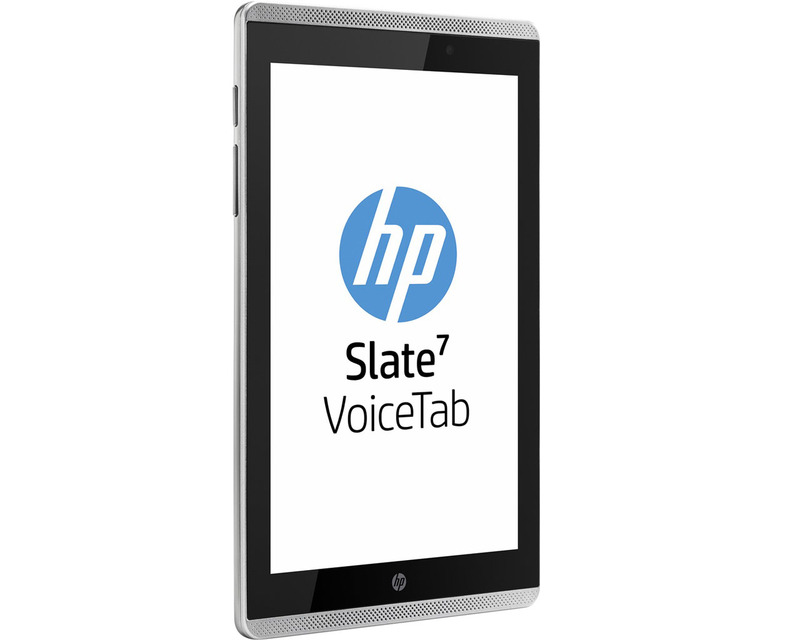 HP grants a 12-month warranty for the Slate 7 6100en VoiceTab. 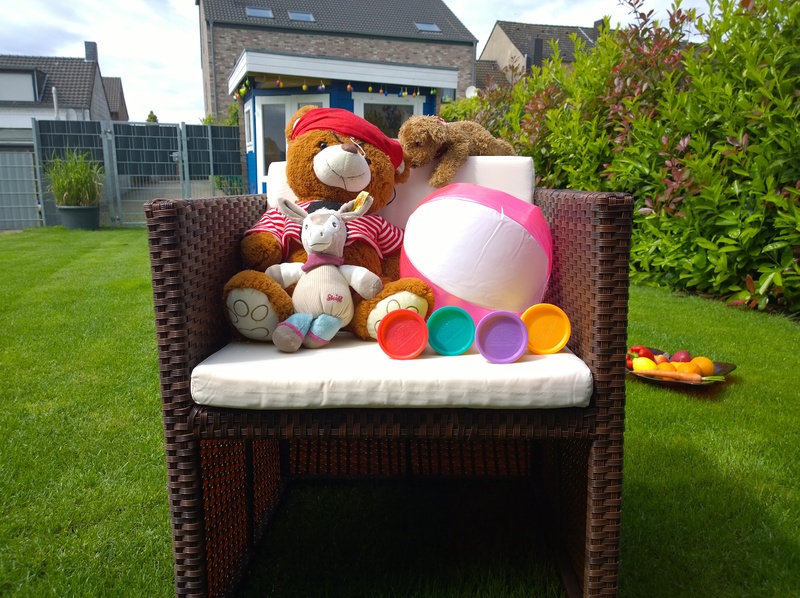 An extension to 2 years is available for about 29 Euros (~$39). The 7-inch touchscreen runs fairly quickly and precisely, and it converts input with minor delays. Due to the bigger display, the keys are also slightly bigger than those of the smaller model. Apart from that all statements that are true for the HP Slate 6 6000en VoiceTab are also true for our test sample. 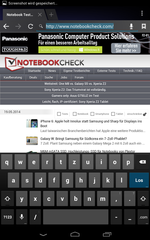 ...landscape mode, the keys are always big enough to type quickly. 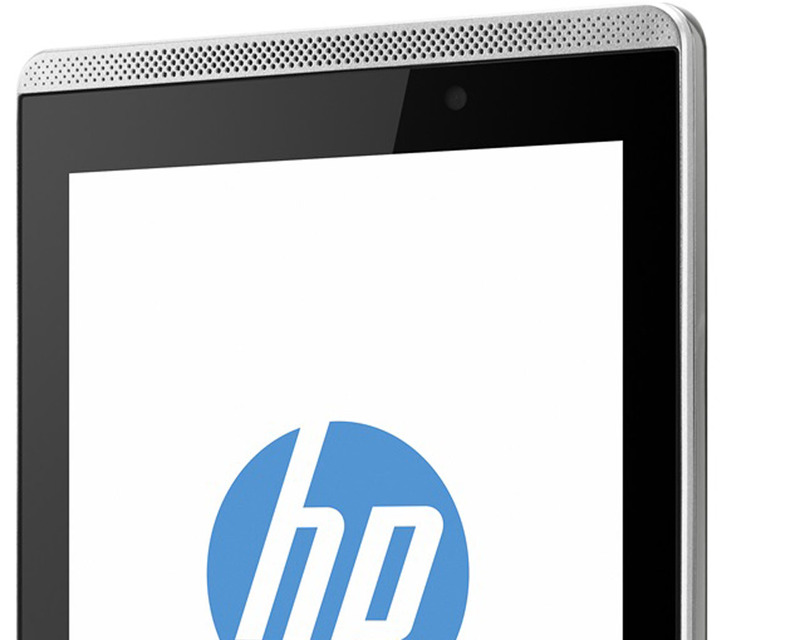 HP treats the Slate 7 6100en VoiceTab to a gigantic 7-inch IPS display with HD resolution (800x1280 pixels). In comparison to the competition there is only one device, namely the significantly more expensive Asus Fonepad Note FHD 6, which offers a higher resolution. 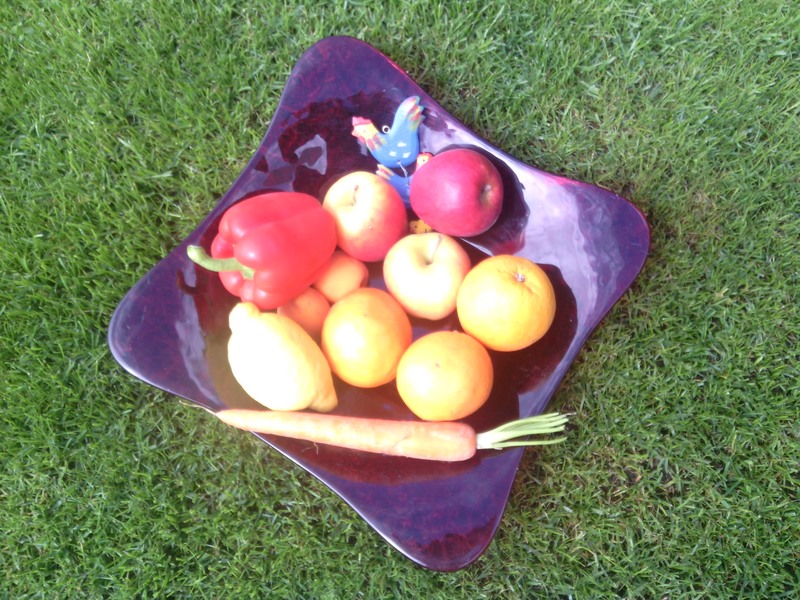 Subjectively speaking the image content was displayed sharply. 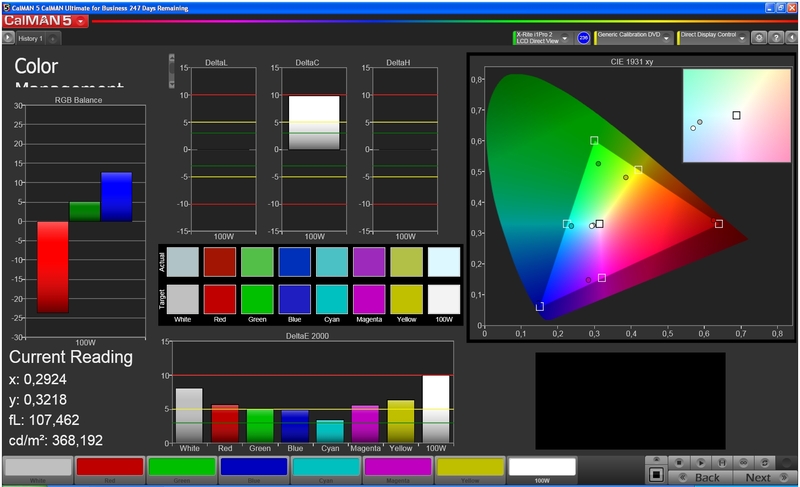 With a luminance of 337.7 cd/m² on average the display shines bright; however, the illumination of 84% is rather mediocre. 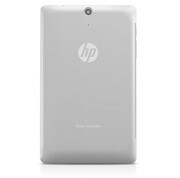 The smaller model HP Slate 6 6000en VoiceTab as well as the whole of the competition has a lot more to offer. With a black value of 0.59 cd/m² and a contrast of 627:1 the test device's results are worse than those of the HP Slate 6 6000en VoiceTab. 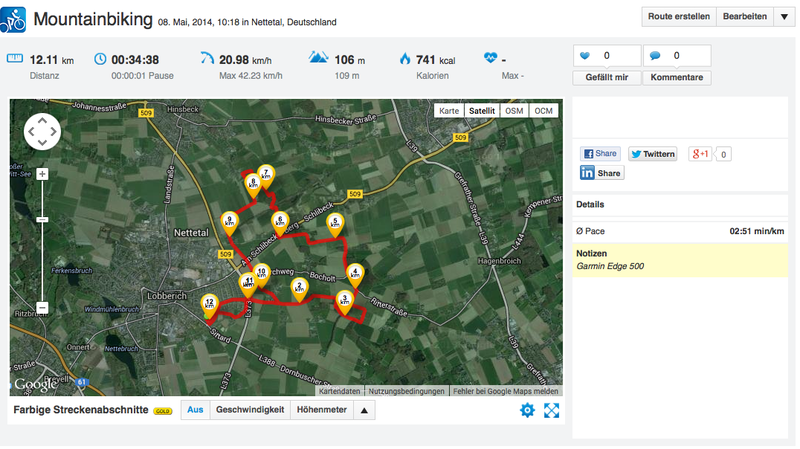 Nevertheless, it is not too bad compared to the competitors. However, the Samsung Galaxy Note 3 Neo SM-N7505 and the Asus Fonepad Note FHD 6 offer considerably better values in this discipline. 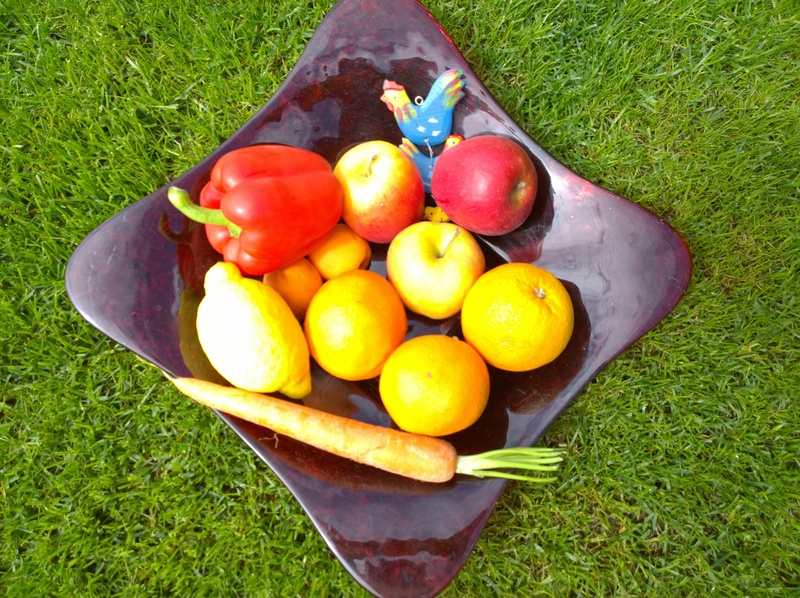 Subjectively, the image content is sharp and has a rich black. 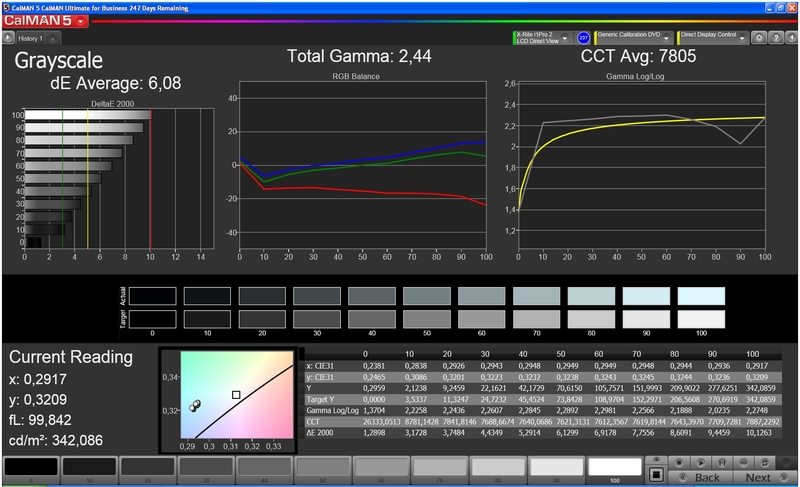 The test with the CalMAN software and the X-Rite i1pro2 colorimeter yields respectable results. 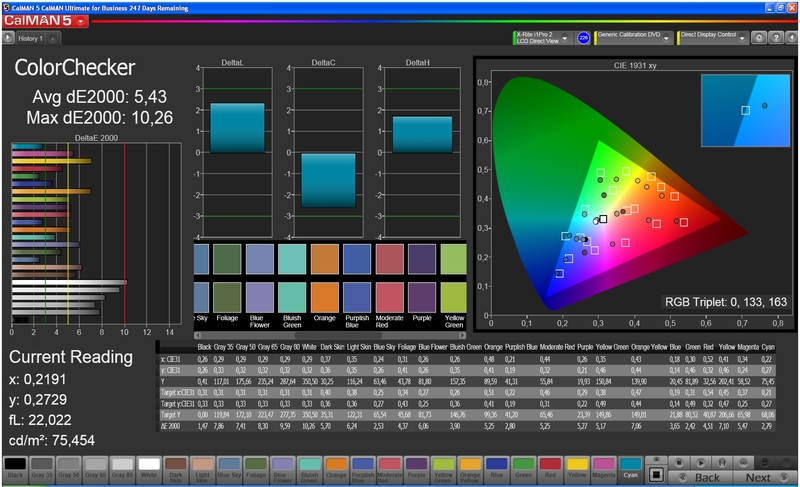 Indeed, the color temperature lies with an average of 7,895 K above the optimum; however, the average DeltaE of 5.43 for mixed colors is good. 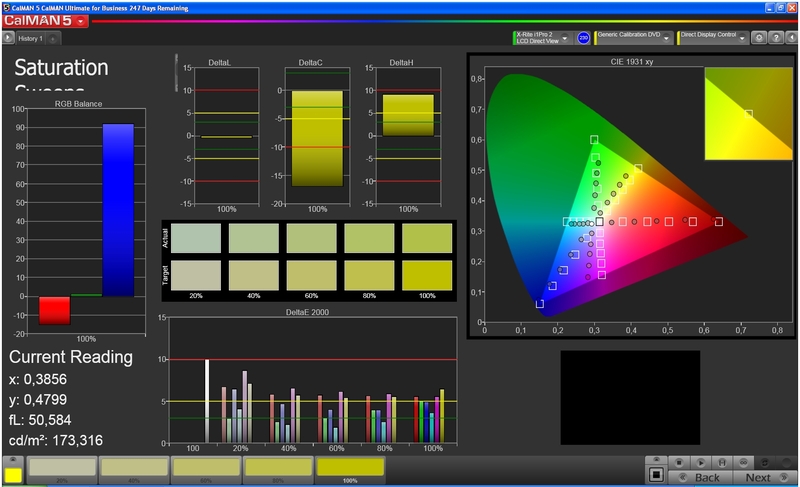 But the color deviation in the green/yellow spectrum is considerable. Lighter gray shades are displayed with a slight green cast. 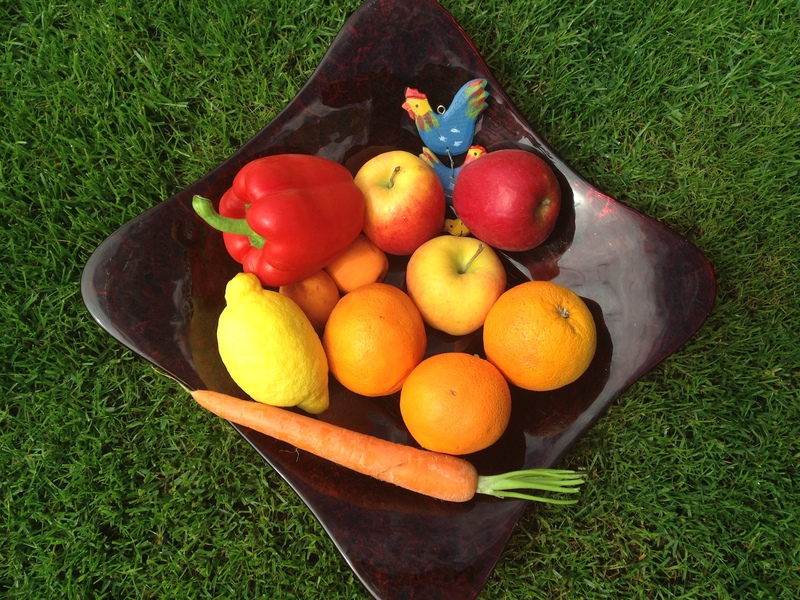 The primary colors show a deviation for red. 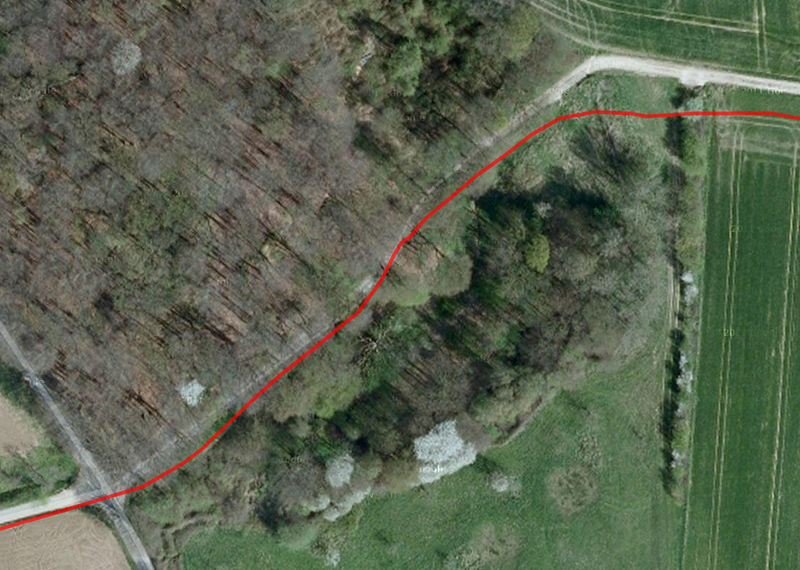 However, subjectively speaking those deviations are not visible. 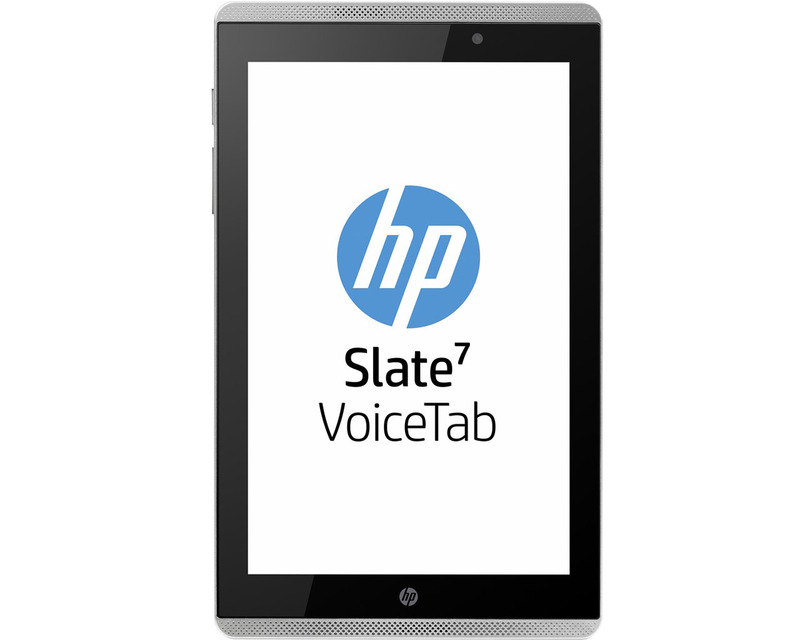 Given the price, the HP Slate 7 6100en VoiceTab makes subjectively a good impression. Nevertheless, in direct comparison the display of the HP Slate 6 6000en VoiceTab looks somewhat crisper in terms of color display. 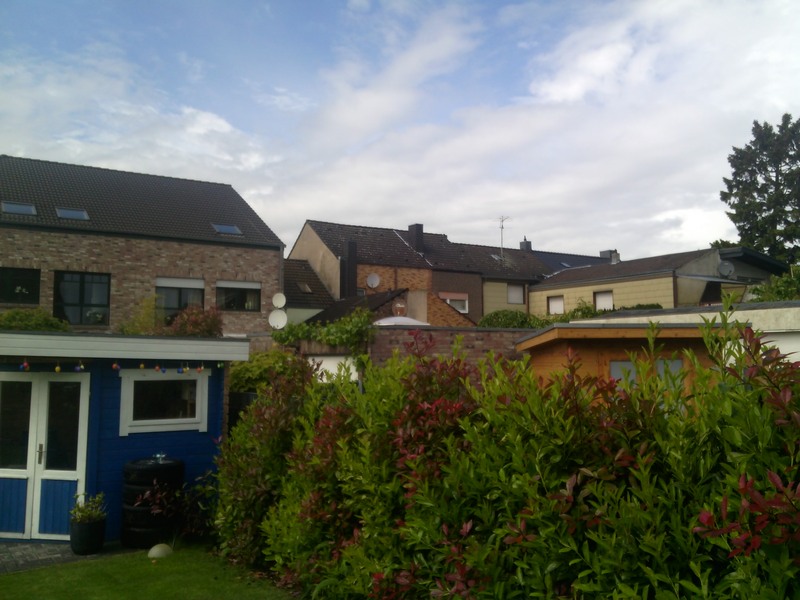 A maximum of 370 cd/m² suffices for outdoor use. However, annoying reflections occur when direct extraneous light hits the display. As long as the user avoids this situation image contents are well legible. Thanks to the IPS technology the display of the HP Slate 7 6100en VoiceTab is very viewing-angle stable. Even at extremely acute viewing angles is the brightness only lowered by a bit and the color display remains stable at all times. The typical glow effect is, nevertheless, visible, especially with unicolored, dark image content. 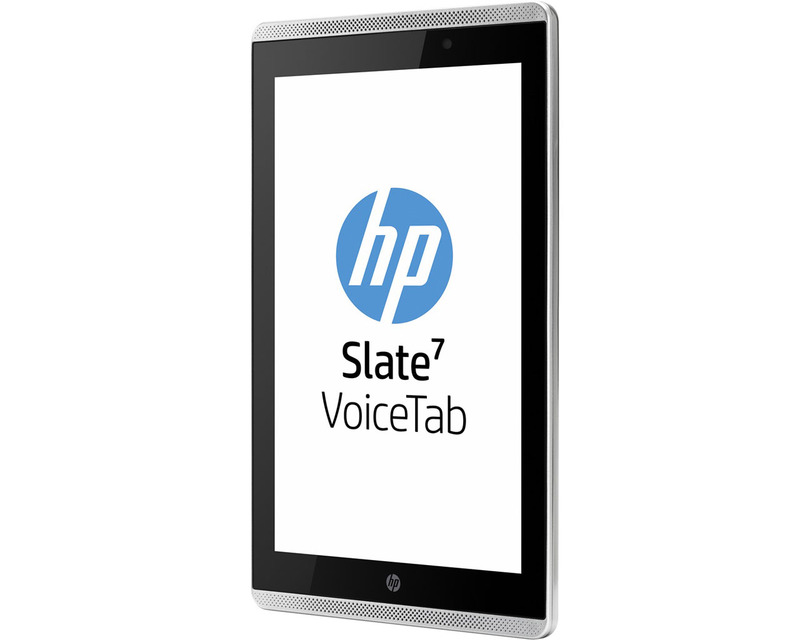 ...HP Slate 7 6100en VoiceTab is well-suited for outdoor use. Viewing-angle stable due to IPS technology. The HP Slate 7 6100en VoiceTab relies on a Marvell PXA 1088 quad-core SoC with a clock speed of 1.18 GHz and an integrated Vivante GC1000+ dual-core graphics card. The HP Slate 6 6000en VoiceTab, which is slightly lower clocked, performed badly in our benchmark tests. 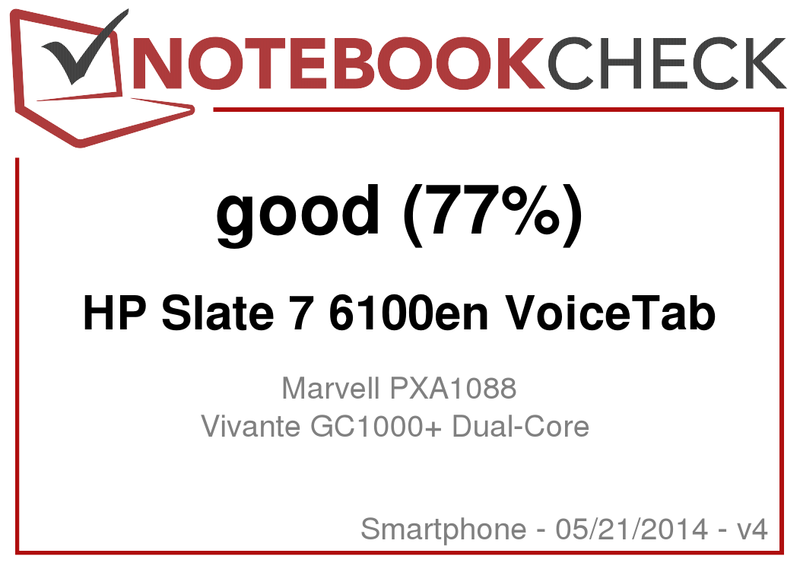 The combination of the Slate 7 6100en VoiceTab is not any different and comes in far behind all the other competitors in all of the benchmarks. Therefore we once again refer to the review of the HP Slate 6 6000en VoiceTab for further information. The significantly stronger devices Samsung Galaxy Note 3 Neo SM-N7505 and Asus Fonepad Note FHD 6 are, with up to 318% more power, ridiculously far out of reach. 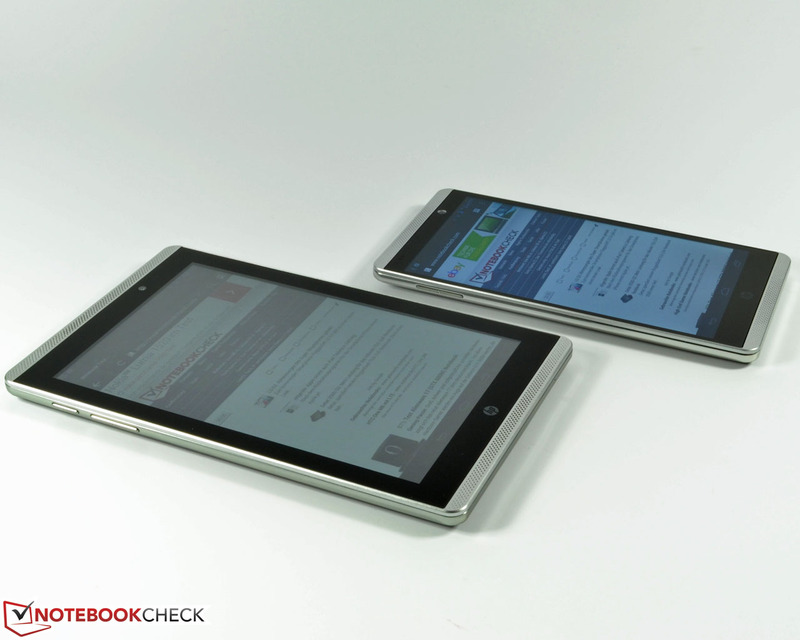 The Huawei Ascend G730 and the Acer Liquid S1 show consistently better results. 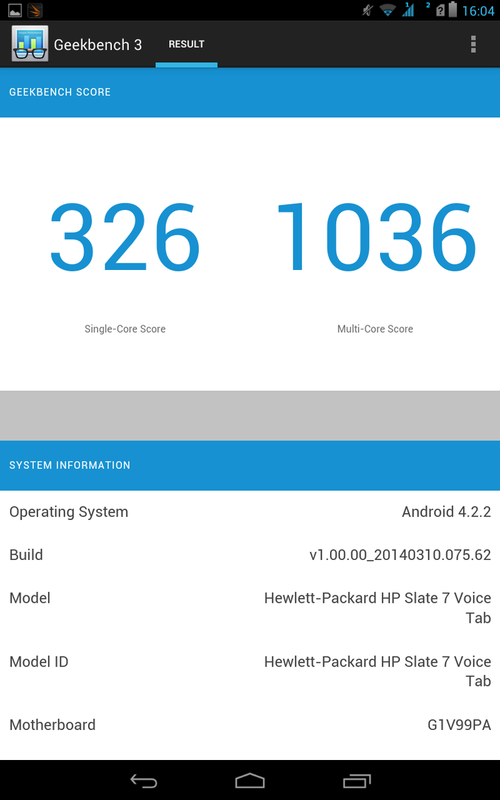 Only in the graphics benchmark 3DMark Ice Storm Standard is the HP Slate 7 6100en VoiceTab able to partly overtake the Huawei Ascend G730 by a little. The internal memory comes off slightly better in the AndroBench 3 benchmark. This time, the HP Slate 7 6100en Voice Tab is at least able to partly pull away from the Huawei Ascend G730 and the Acer Liquid S1. Nevertheless, the Samsung Galaxy Note 3 Neo SM-N7505 remains once more beyond reach. 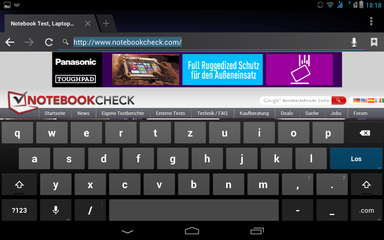 In comparison to the competition the browser-based benchmarks also attest the test device little power. 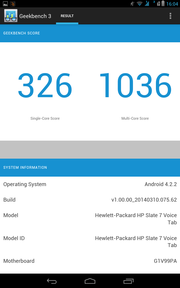 In the benchmarks Mozilla Kraken 1.1 and Octane V2 it is able to overtake the Huawei Ascend G730 and the HP Slate 6 6000en VoiceTab. In Peacekeeper and in SunSpider only the latter comes off worse. The other competitors are clearly better in every single benchmark. Due to the identical Vivante GC1000+ graphics card, the HP Slate 7 6100en VoiceTab shows an almost identical gaming performance as the HP Slate 6 6000en VoiceTab. You find more information in its review. The control via touchscreen and the position and acceleration sensor worked impeccably. The temperatures at the surface of the HP Slate 7 6100en are always at a pleasant level. In idle mode it reaches on average of only 30 °C. Under full load the temperatures rise to an average of a still reasonable 33 °C. At some spots the case heats up to a maximum of 39.1 °C. However, the power supply reaches around 40 °C in idle mode alone. Therefore it should always be located in the open. 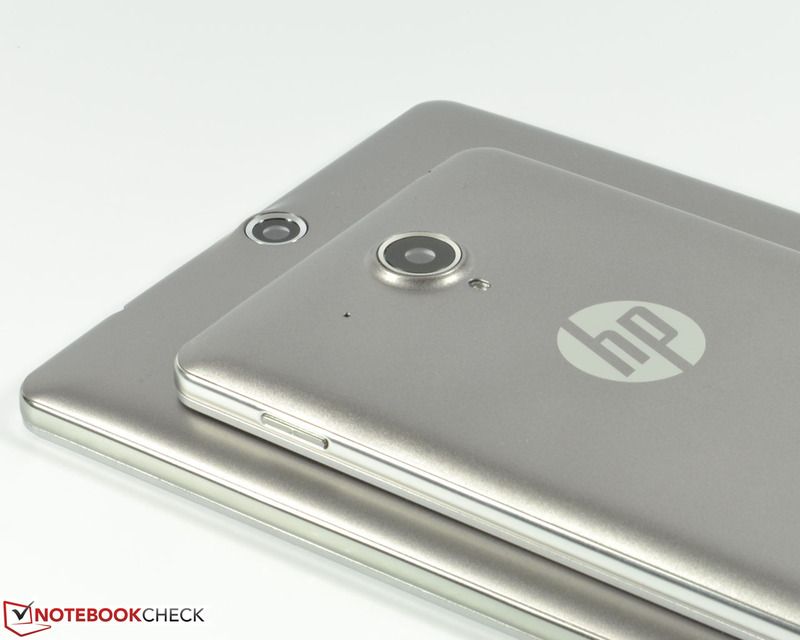 Just like the Slate 6 6000en VoiceTab, HP installs the stereo speakers on the test device at the front. The sound transducer suffers from acute lack of bass and overemphasized highs with faint mids. The maximum volume is decent, but the speakers tend to overmodulate a bit when fully turned up. When external playback devices are connected via the 3.5 mm jack a high maximum volume is possible. The sound is pleasantly low-noise. 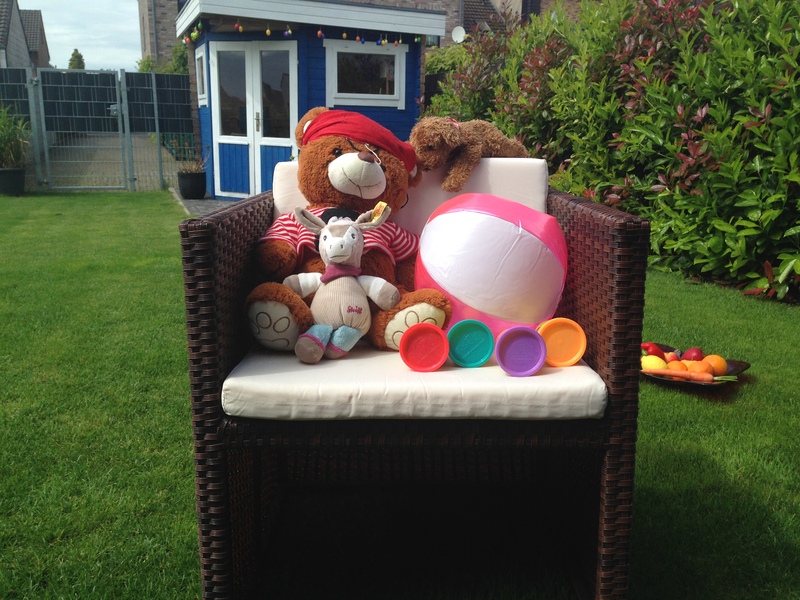 The practical test was not able to prove our previous assumption completely. In full-load operation the test device turns off after only 2:49 hours. 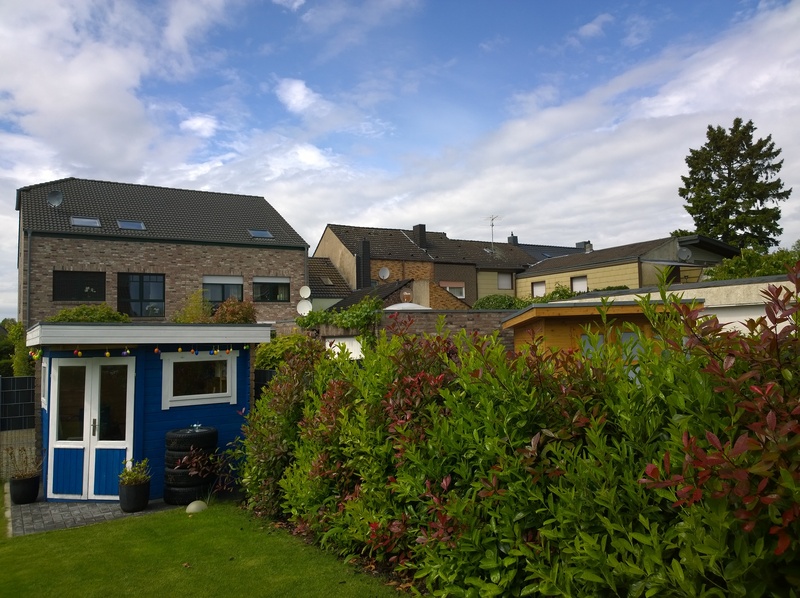 The HP Slate 7 6100en VoiceTab terminates the surf test via WLAN at 150 cd/m² after 7 hours and 38 minutes. Given the 15.17 Wh battery (4,100 mAh), this is disappointing, especially since the HP Slate 6 6000en VoiceTab is slightly more enduring despite its smaller battery. 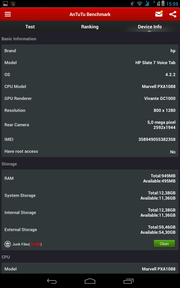 In comparison it, admittedly, is able to overtake the Acer Liquid S1 (9.12 Wh) but does not reach the runtimes of a Huawei Ascend G730 (8.8 Wh). The Samsung Galaxy Note 3 Neo SM-N7505 (11.78 Wh) and the Asus Fonepad Note FHD 6 (3,200 mAh) also last significantly longer. 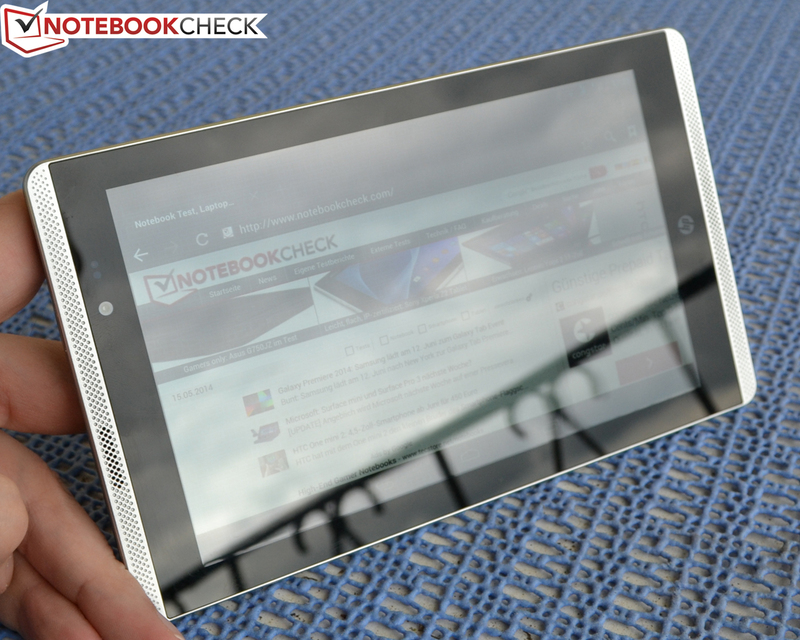 Our verdict for the HP Slate 7 6100en VoiceTab has its ups and downs. 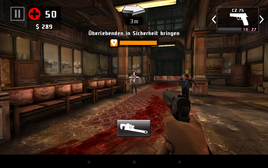 For a smartphone in tablet size, the test device offers good equipment for a moderate price of 219 Euros (~$297). The dual-SIM functionality is just one asset. Other positive aspects are the bright IPS display with HD resolution and a gigantic 7-inch display diagonal as well as high viewing-angle stability and a good color display. The quad-core SoC with integrated dual-core graphics card is not one of the most powerful chips in its range but offers enough performance for most of the applications. The battery runtimes at adjusted brightness allow working one day without the need of a charger. However, unlike the 6-inch model HP Slate 6 6000en VoiceTab, the battery cannot be exchanged easily. 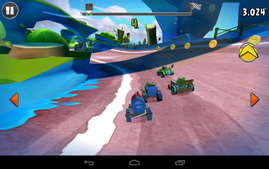 Another advantage is the memory that can be extended via microSD card. Points of criticism are the cheap-looking case and the dull speakers. The former is at least sturdy and built well. 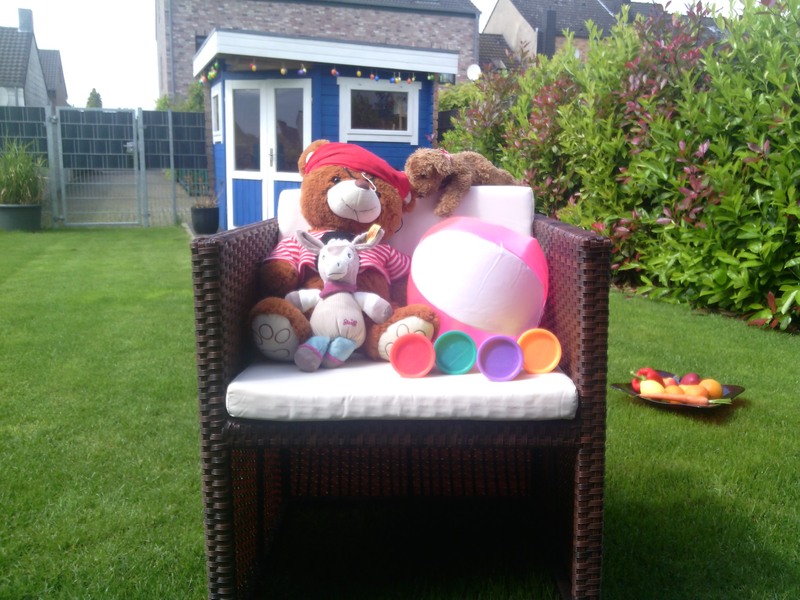 The camera modules are only useful for the occasional snapshot. The front-faced speakers are also just a less-than-ideal solution. 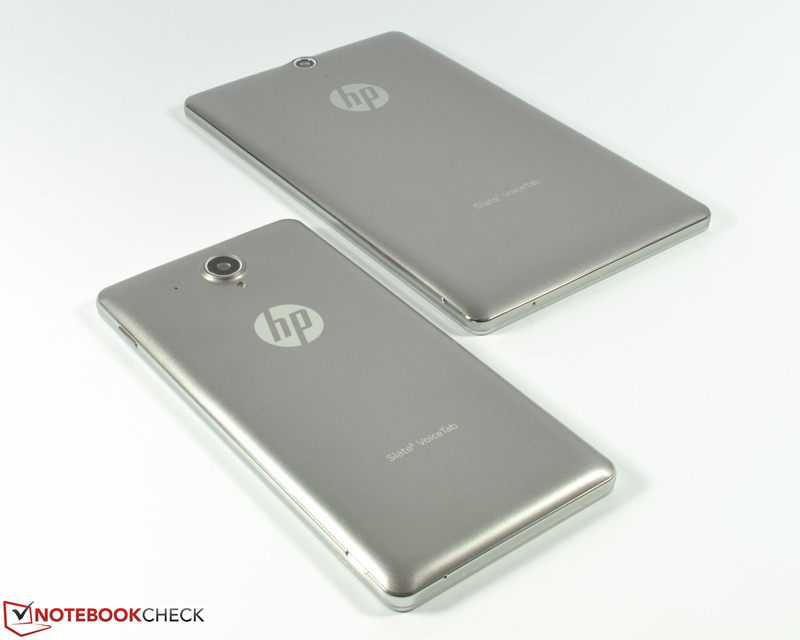 All-in-all HP offers with the Slate 7 6100en VoiceTab a decent phablet with a good cost-benefit ratio. As long as the user does not need demanding applications and the focus is set on flexible use, the HP Slate 7 6100en Voice Tab is certainly worthy of consideration. 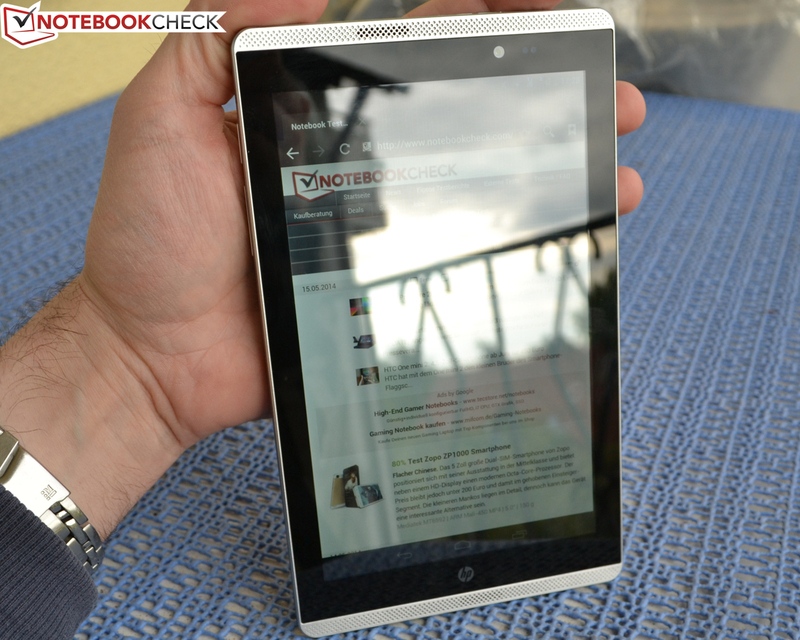 In Review: HP Slate 7 6100en VoiceTab. Test model courtesy of HP. 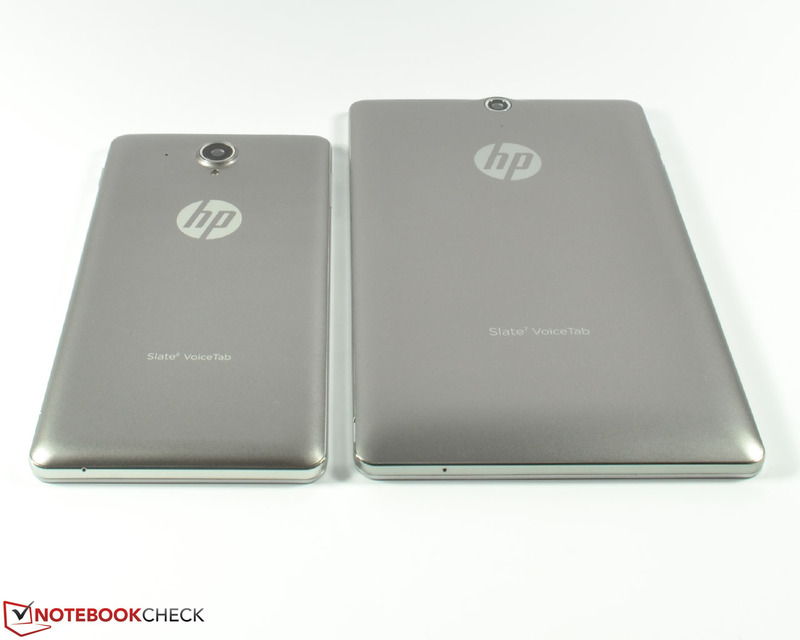 HP introduces a new series: The Slate VoiceTabs. 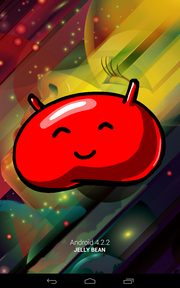 The operating system is Android 4.2.2 Jelly Bean. 7-inches versus 6-inches. 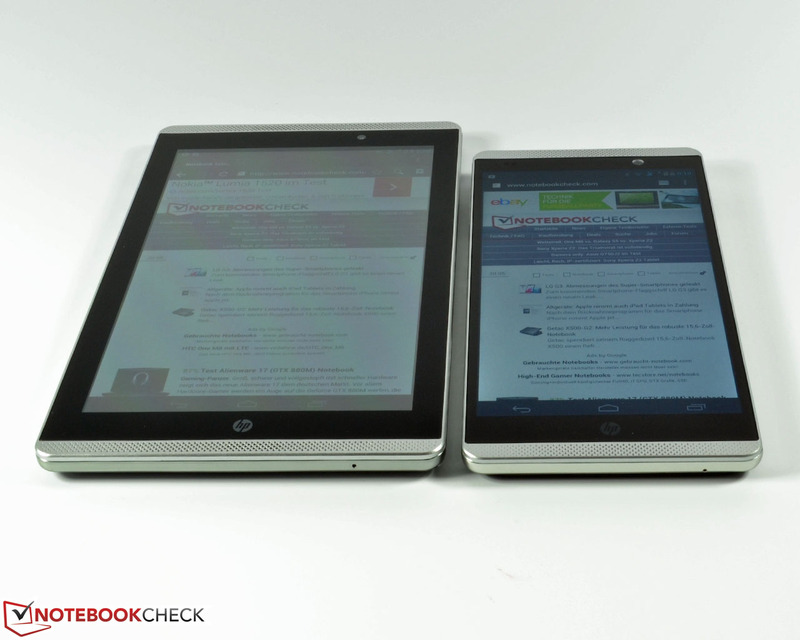 The HP Slate 7 6100en VoiceTab is very similar to its 6-inch relative. 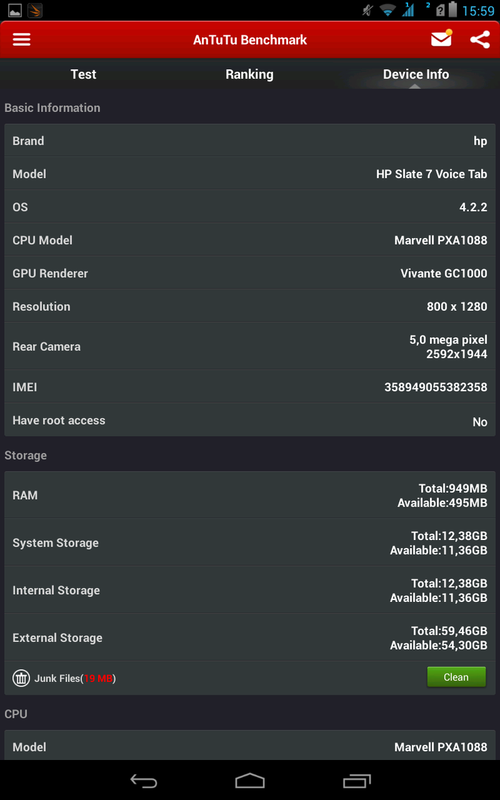 AnTuTu v4 recognizes the Marvell PXA1088 and further equipment details. Neither GFXBench 3.0 nor 2.7 worked. The microphone is, in both phablets, located at the lower edge. 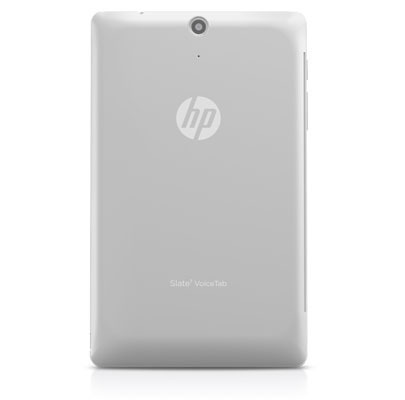 Ergonomically speaking it is quite unfortunate that the power button of the HP Slate 7 was moved to the volume rocker. Micro USB 2.0 and the 3.5 mm jack have also traded places. The back cover can be lifted via the indentation at the right edge. Underneath: SIM card slots, battery and microSD interface. The VoiceTabs are almost identical in thickness. 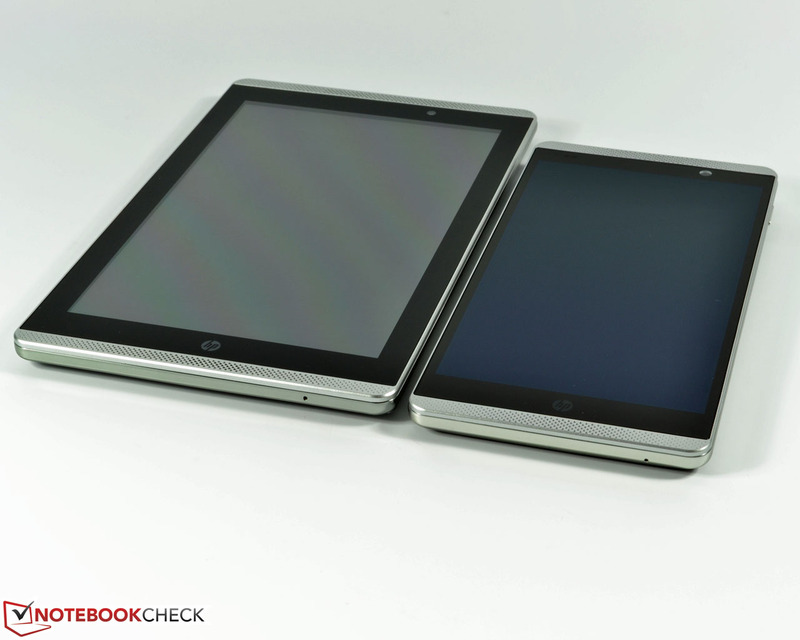 The display of the 6-incher is better than that of the 7-inch model. Both score with a good color display. ...are only available in silver. Both main cameras have a resolution of 5 megapixels. 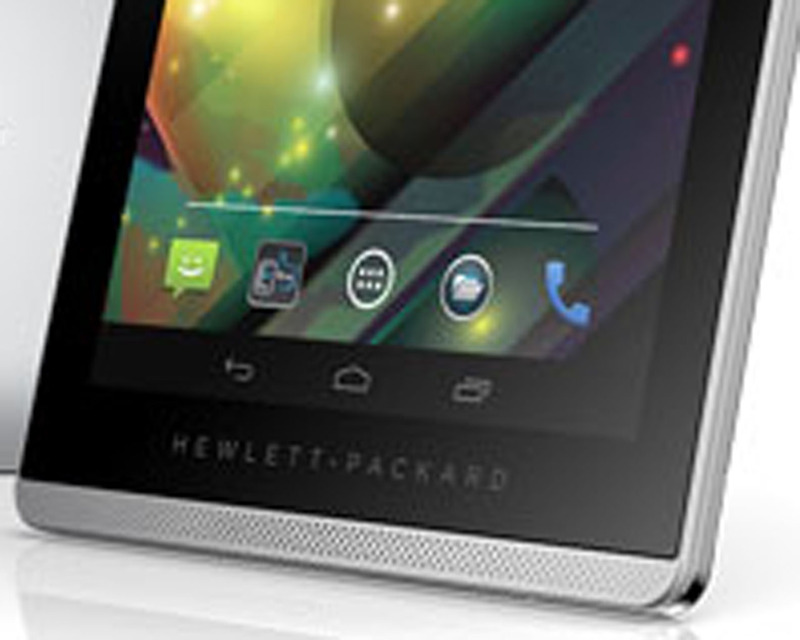 But only the HP Slate 6 VoiceTab is equipped with an LED flash. 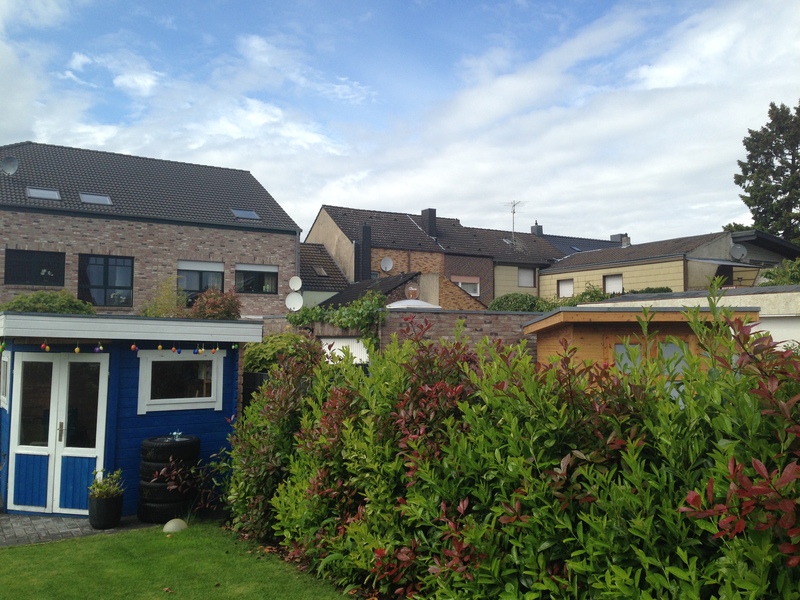 The webcams, however, are completely identical. 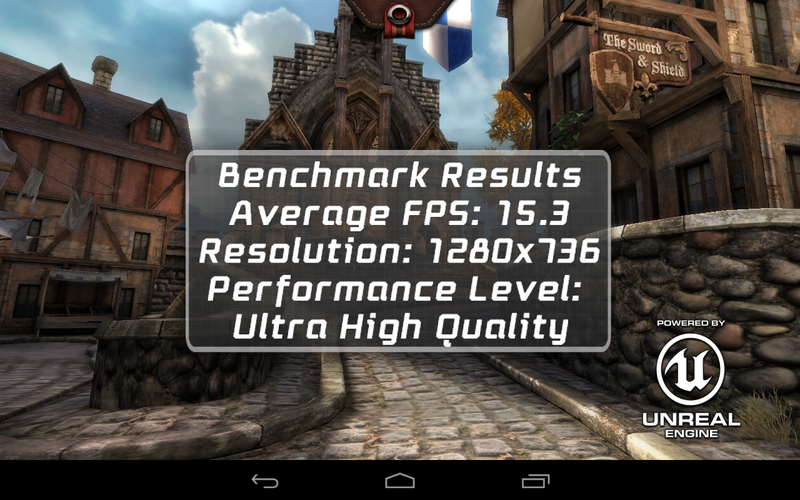 The graphics benchmark Epic Citadel proves: The HP Slate 7 VoiceTab is not made for gaming. 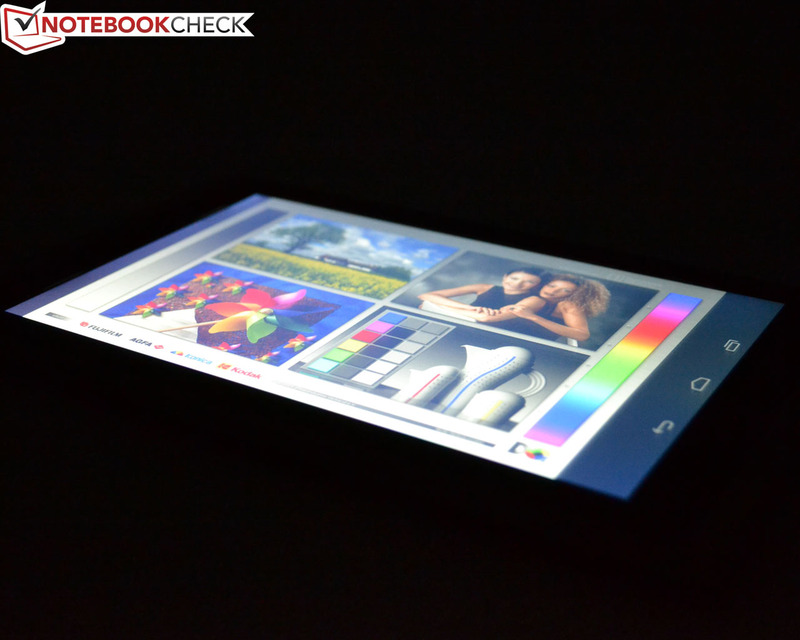 The bright IPS display and that the memory can be easily extended. A somewhat more powerful SoC and 3G functionality for both SIM slots. The low price given the decent equipment.